Title: Love at first bite!!! Quickly wiping her tears away she opened the door and saw a girl who had ragged her just few days back. Yes, it was her senior, every fresher's nightmare, the one who made her measure the room with match stick, the same aweful senior who made her write a love letter to hostel watchman. Here is my humble Dharwad Thali which I sincerely tried to recreate for this month’s RCI-Karnataka. Thanks to Ashakka and Lakshmi for giving me opportunity to indulge in my secret love affair with Dharwad cuisine after long time. Prepare dough by adding red chilli powder, salt to taste and by adding warm water gradually. Let the dough rest for 15-20 minutes and again knead the dough well. Place the dough on flat surface dusted with generous amount of flour and using your palm spread the dough into flat, thin circle. 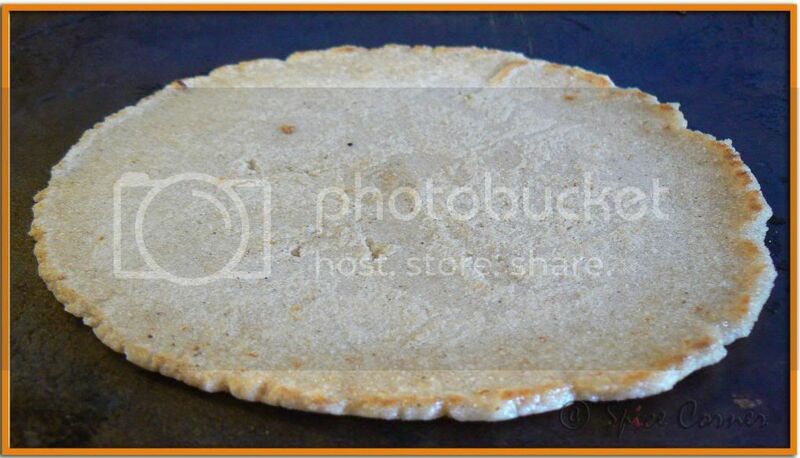 Carefully transfer this flat roti on hot iron griddle and roast this roti on medium heat. Gently press a wet cloth on the cooked surface of roti and turn it on other side. Do the same with other side of the roti and cook until you see brown patches on the surface and the roti stats to puff well from centre. 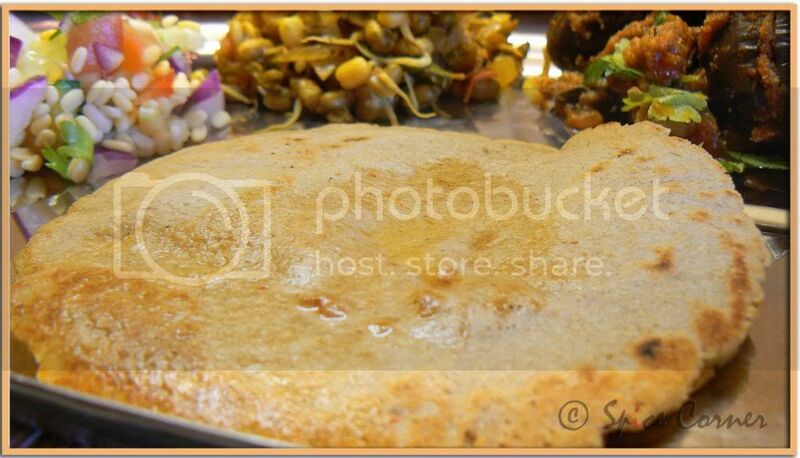 Serve the roti with any side dish of your choice with a dollop of freshly churned home made butter on top. As Jowar is glutton-free flour, practice and patience is needed to make unbroken, thin rotties. When making this for the first time, don’t press the roti into large circles as it will easily break while transferring into tawa. So make small palm sized rotties which are easy to transfer without breaking them. Another simple technique which can be used while making jowar rotti is to press the ball keeping it in between parchment or greased plastic sheet and press it using flat surfaced vessel or plate. This way you can not only make thin rotties but also it can be easily transferred onto tawa. Click here to check another variation of Jolada rotti from Spice Corner Archives where I have used Beetroots to give it extra flavour. Badane Ennegayi is a popular dish in Karnataka and is a great accompaniment with Akki Rotti or Jolada Rotti. Desiccated coconut is ground with aromatic spices and stuffed in between baby brinjals and the tender eggplant when cooked defines new meaning to taste. Grind coconut, coriander seeds, jeera, tamarind juice, peanuts, turmeric powder, red chilli powder, sambar powder, kitchen king masala and salt to taste to smooth thick paste (chutney consistency) by adding little water at time. Mix this ground paste with finely chopped onion and coriander leaves and keep aside. Make plus marked slits on baby eggplants keeping their stems. 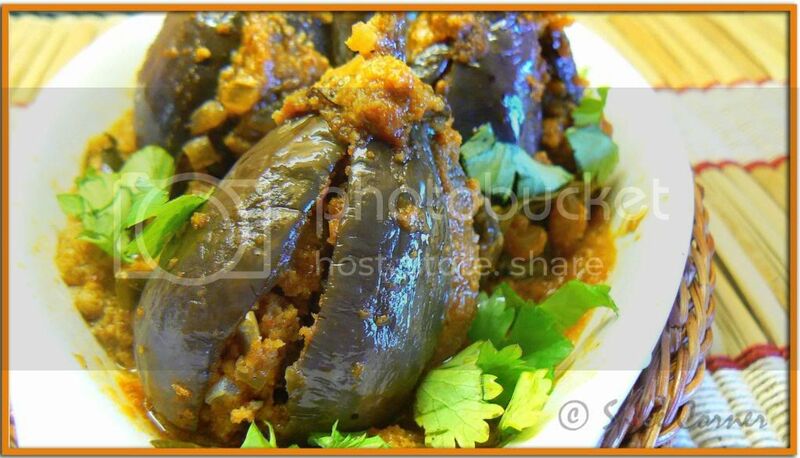 Take about 1-1½ tbsp of masala and stuff it in slit baby eggplants. Heat oil in heavy bottomed pan and add jeera, curry leaves and hing. 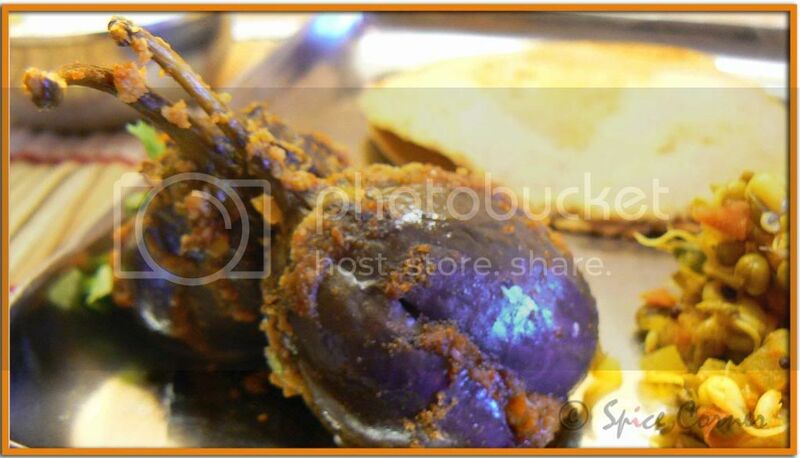 When jeera starts to pop and sputter place stuffed eggplants and arrange them in a pan. Add remaining masala to the pan and reduce the heat to low. Add about 2-3 tbsp of water if needed. Cover and cook the eggplants on low flame stirring in between so that masala don’t stick to the pan. Cook it for 15-20 minutes till eggplants are evenly cooked. 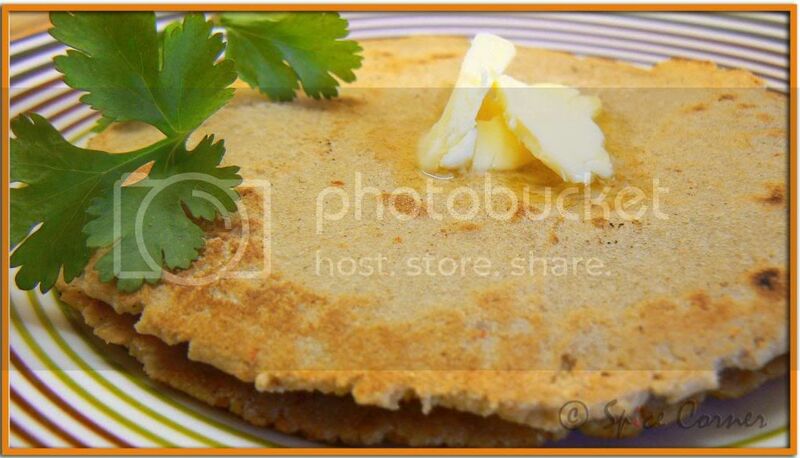 Serve hot with Jolada Rotti or Akki Rotti garnished with chopped coriander leaves and enjoy. Usli, usually made using different sprouts available is high source of protein and can also be served as an evening snack. 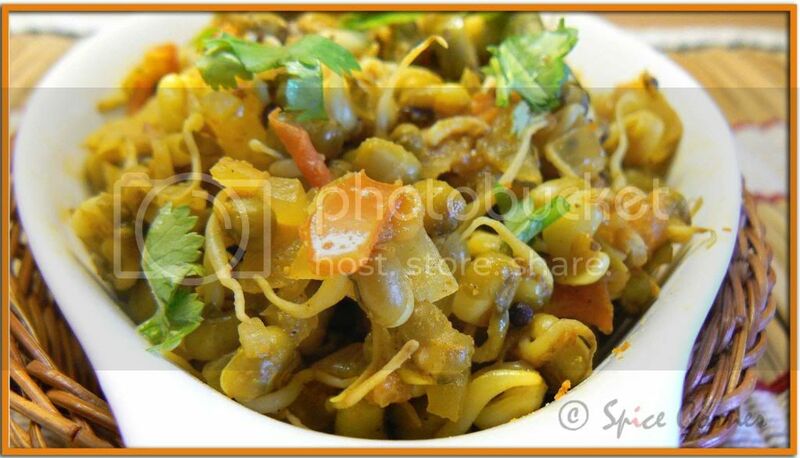 Tender moong sprouts and cooked with crunchy onion and tangy tomato and flavoured by freshly ground spices. Heat oil in a heavy bottomed pan and to this add urad dal, mustard seeds, jeera, hing and curry leaves. When mustard seeds starts to pop and sputter, add finely chopped onion, ginger and slit green chillies. Sauté it till onion turns translucent and add chopped tomato. Sauté it for around 1 minute and then add turmeric powder, coriander powder, jeera powder, red chilli powder and stir in. Now add moong sprouts, ¼ cup water and salt to taste. Cover and cook for 10 minutes till the sprouts are cooked but retain their shape. Remove from heat and mix lemon juice and chopped coriander laves and serve hot with rice or roties. Kosambari is popular south Indian dish usally prepared as Neivedyam during festivals(with no onion). It’s a light and healthy salad. Soak split moong dal in water for about 1-2 hours and drain. Mix all the ingredients and serve garnished with chopped coriander leaves. Every south Indian meals end with a serving of Curd/Yogurt. Raita is made using yogurt, different vegetables, usually raw vegetables, and is seasoned with tempering of mustard and curry leaves. Beat the yogurt removing all lumps and add all the ingredients and mix well. Chill before serving with Roti and rice. Chilli-garlic chutney is a speciality of Dharwad meals which uses the chiili called Byadgi Chilli. It gives a fiery red colour to any dish when used. Check here for more details on Byadgi chillies. Soak dry red chillies in warm water for 10 minutes and drain. Using mortar and pestle crush all the ingredients into smooth paste and serve with Jolada Rotti and curd rice. A good blog buddy of mine Meena of Memories from Mom's Kitchen is running the Portland Marathon this year to raise funds for AID (Association of India’s Development) which is a non-profit organisation in India. "AID has been working to eliminate grass root problems in India for many years now. We have seen that the effort brings about remarkable changes in people’s life and gives them hope for a better future. To continue the good work, we need support from every one of you. It would mean a lot to me if you can please visit my Marathon Fundraising Page and show your support. Every small contribution from your side is going to bring about a major change to someone's life. I hope to get all the support I need to raise this money from my fellow bloggers, friends and family. The actual marathon date is on Oct. 7th. You can also find weekly updates about my run on the fundraising page. " What a feast.. Beautiful presentation and so many delicious sides to go with it. OH my god sups! Beautiful post! The story is so cute! reminds me of my engineering days! And i just love the thali! I lived in Hubli for 2 years (studied at PC jabin) and i ate jolada rotti with usli, yengai and kirk sali palya (the greens palya) all the time! I miss those times! And even last time i went to india (jan) i ate jolada rotti oota at kamat lokaruchi on bangalore-mysore highway! U make it seem so simple. I am going to have to recreate this at my place! Wish u lived closer! Hugs girl, thanks for jogging those memories! Lovely oota, Sia. Jowar and bajra rotis are my favorite too, they have such an earthy taste. I am going to try this whole platter of yours! I too love the kind of food they have in Northern Karnataka. plain jowar rotti taste good by itself, and with yennegai, its beyond desciprion! and such a cute write-up, sweetie! Oh and the Northern Karntaka cuisine shares similarties to Marathu food.....jolada roti becomes bhakri, usli becomes usal and chilli-garlic chutney, the thecha! Its always comforting to notice these similarities.....the true spirit of our nation! and once more, i LOVE that story. i gotta gotta gotta know this. what did you write in the love letter to the watchman? did you make a photocopy? do you still have it? Oh my! I want to pull that thali and polish everything off! It is truly a treat for the eyes (and for the tongue I am sure)! I tried making jolad rotti once and it was an unprecendented flop show. Never have I had the courage to try it again but I am tempted, very tempted now! Fabulous entry Sia! wow..I am full after reading all the recipes. I mix equal amounts of wheat flour and jowar to make the dough kneadable/rollable, tastes like chapathi though! I have to say, either you have a solid memory or you have been to that restaurant more than a hundreds of times in those 4yrs. How could you remember that elaborate meal menu? Wish I had an award to give you for this temptingly delicious jolada rotti spread! *bows* to the Queen of Jolada Rotti Oota! May I get some prasad! Wow Wow that is one fantastic plate Sia, I am drooling at the Eggplant Curry and everything else, don't know what to pick. Wow ! 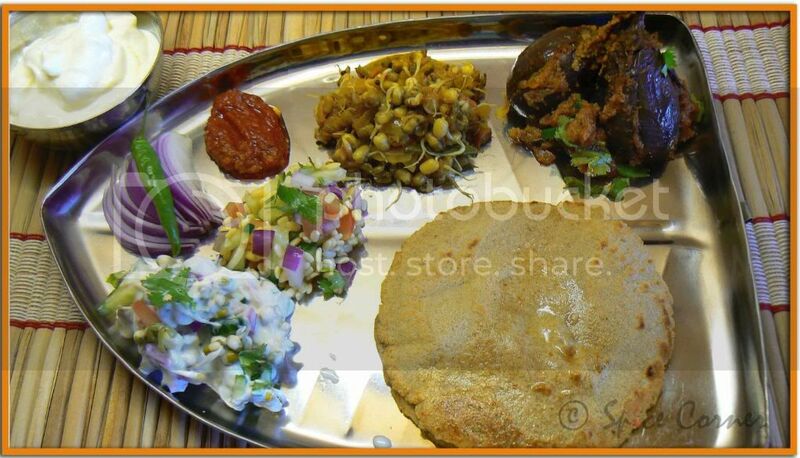 beautiful thali of food ...looks so delicious.. will you share some of that food with me ? I have visited your site for the first time. And the pictures & recipe for this Thali has taken my breath away. 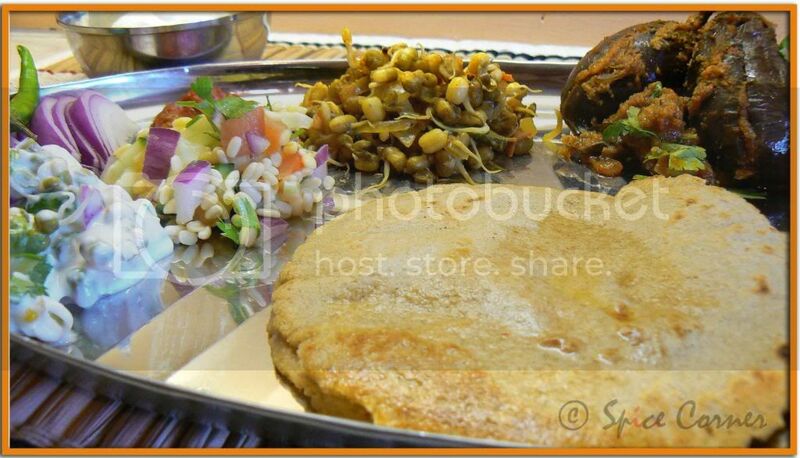 I just hope I can find jowar atta in US to re-create this on the coming weekend. Sia, you have your way with words.Such a beautiful spread.I have never tried bajra roti's making me want to try some. beautiful pics. give me jolada rotti any day and i'll gobble it up. on one of my assignments as a student i had to visit a lot of villages in north karnataka - not a single went without a bite of soft fluffy jolada rottis. Sups, I was in splits reading about the ragging episode!! I can understand how miserable that would ahve made you :) Your pictures are great as usual. Our maid in Mumbai had made jolada rottis for us, but we didn't even manage to put circles on the tava,let alone puffing them ;) I'm bookmarking this page! Btw, I thinnk you should write a novel, you are a very good story teller! I'm off tomorrow to you-know-where :) Praying the weather is fine while we are there! :) Take care! Oh My, what a delicious looking Thali!!! Its really a feast!! Your post reminded me of my trips to Kamat Yatri Niwas!!! Was the watchman smart ;). BTW, you are killing me with this delicious spread, Sia! now thats very mean of you to share the story and not the content of that love letter!... :D...lovely looking thali sia, just so beautiful...very nice of you share this with us..
nice write up and a even nicer spread. 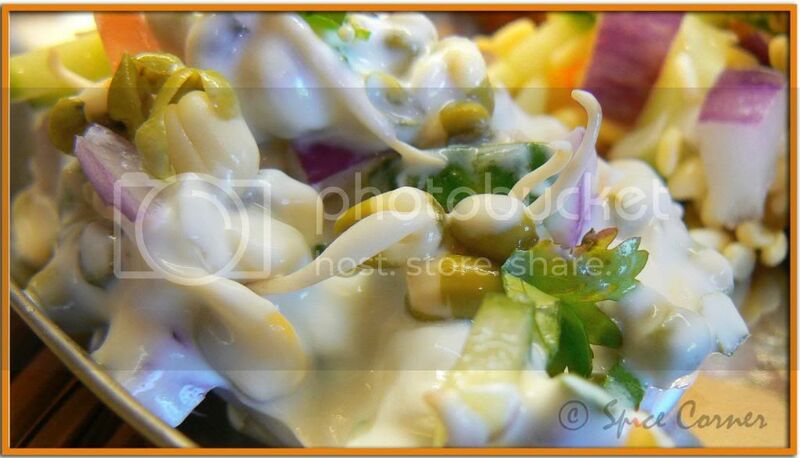 awesome choice of dishes and pics to match :) asha must be so thrilled! BEAU-TI-FUL!!! Thank you for taking time for cooking allthese and fro me.I appreciate it! Looks fabulous.I will take URL and A photo of Thali, will save you some time. What a beautiful thali, Sia! Your passions shines through in your preparations, your writing & your beautiful pics.I don't know what else to say! that is a fantastic thali, sweetie! 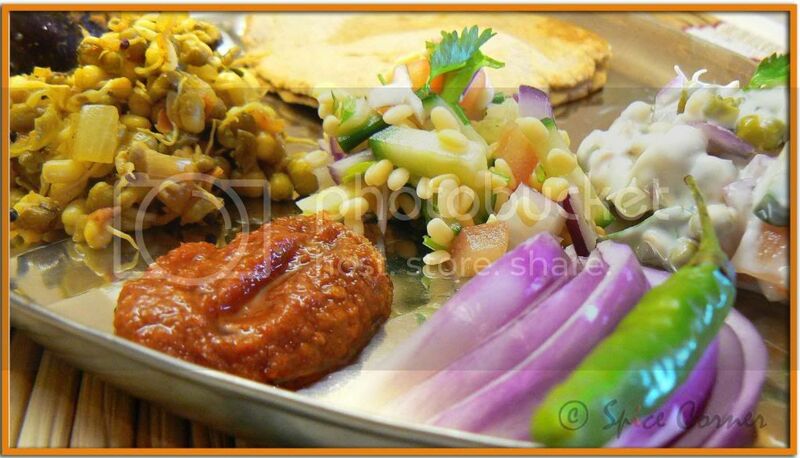 my mouth just can't stop watering, am coming over for lunch :) loved the shape of that thali as well. will be sure to try ur recipes sooooooon!! i remember the hungry souls during hostel days, but it sure was fun all the way he!he! This is my first comment on your blog although I visit it often. Thanks for the wonderful thali. I have always wondered where all the North Karnataka women are in the food blog world. Atleast we have somebody who lived there and can cook close to the authentic one. Do you have any other recipes from there, esp using huchchellu/gurellu? I have eaten so many of their dishes in restaurants but just cant recreate the same taste at home yet. i have not tried mixing any other flour with jowar as i like the rustic and earthen taste of jowar rotti. resting it for 15 minutes in water helps in making it kneadable. try it that way and u can reduce the amout of chapati flour. Wow. 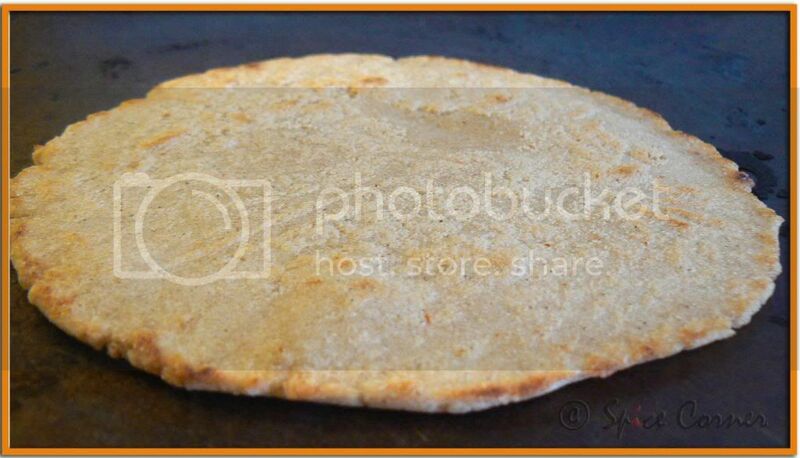 The Roti looks great. I love the idea of moong in pachadi. Great going! 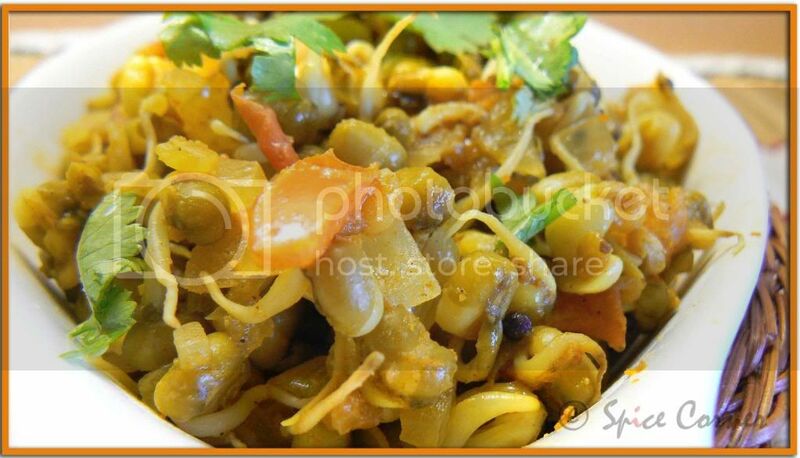 I've been looking for some moong sprouts curry recipes. This one is perfect. Wharewah! !What an amazing spread! !You must have taken a real lootsa time for this post!well written! !Hats off to you Sia! hey very nice Supriya.. just few days i had jolada rotti oota in Kamath yaatri nivas.. really nice oota.. i hope u know this place.. allada.. liked the presentation.. henge madte estella oottige? great! i have already sent my entries through mail. thank u for dropping a line and leaving behind trails. i appreciate that. there are many blogs from kannadigas around in blogsphere like asha's foodies hope, manjula's dalitoy, shilpa's aayi's recipes, roopa's my chow chow baath and seema's recipe junction and everyday there is new addition to set of bloggers. i am sure you will be able to find few authentic north karnataka dishes from these blogs. i will try to find out kirk sali palya, kadle palya, recipes using huchchellu etc and try to post them. i have tried surfing the net for authentic north karnataka recipes but am quite dissapointed with the results i got. oh wow!!! this time when i am in b'lore i am surely gonna have food at KYN... how i miss such authentic food. My god!! !what a Chef hiding behind a MBA holder....i wondered at your presentation...so many recipes....which is healthy too..sprouted one..brinjal wow!what a beautiful presentation...You are simply superb. I'm sure going cook all of these dishes. Everything looks delicous. Beautiful pictures. Wow! Each and every thing on that plate looks fabulous. waw what a delicious oota!! looks mouthwatering and..... out of words.... loved all the recipes , esp the sprouted moong. wanna try that. wow!! !..that is one real solid feast for mankind!!! LOL... i dont think my degree helps me when it comes to cooking;) but yeah, i did learn basic time management which helps me a lot when it comes to cooking many dishes:) i am glad u liked them ushi darling:) how have u been? feels like its been long time since i heard from u. 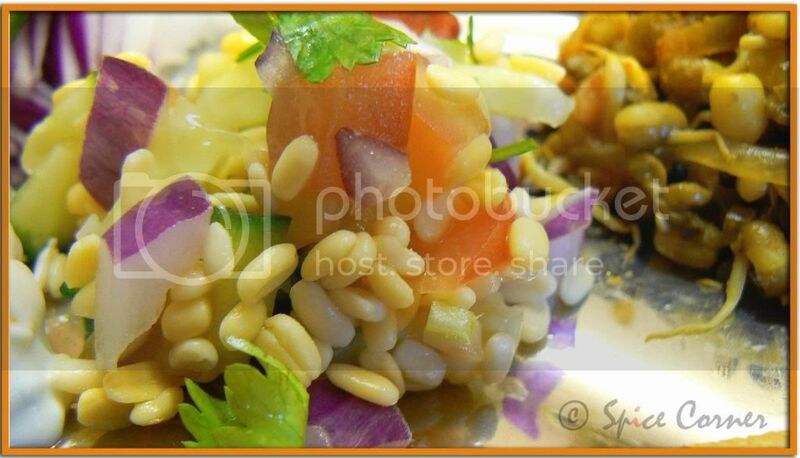 Great post with such lovely dishes sia!! I liked ennegai the best mouthwatering pictures! Then kosambari is tempting too! What a thali..loved it. Its similar to marathi food. Btw i m missing my hostel days now. I haven't found many N.KA dishes on any of the other kannada bloggers' sites. I agree there are no special recipes out there on the net either...Appreciate your trying to get more of them for us. Thanks. thank u pooja:) it may look similar to marathi food but if see see closly u will find difference in the ingredients used. Nice post, and I like the little motif you put in your comments! I recently bought a packet in Hubli (en route the Goa trip in March) but later found holes in the packet, so threw it away, ate just one, I think. And you have a gift for making your curds and onion look whiter than white and purpler than purple! Sia, I have no words to say. Beautiful platter with mouthwatering dishes. Awesome as usual. Bookmarked the entire page. BTW, do you know the recipe for Dharwad pedas? Yeah, I'm keenly waiting for the roundup. Though I dont blog I'm an avid foodie just like u guys. I might guest blog on my friend Roopa's blog (Kitchen Aromas) before the end of this event. Hi Sia! thali looks amazing and great entry to a lovely event too. Love the stuffed eggplants. Thanks for sharing. Omigosh Sia..Too good..My fav oota :) We frequently go to Kamat in Basavangudi for this meal...We just love it..But i have never tried making jolada rotti at home..The pics are lovely. thanks my dear:) hw have u been? thanks suma. i don't have a recipe for dharwad peda at a moment but my mom makes them quite often. i will get recipe from her post when possible or will mail u.
glad u liked it:) try stuffed baingan as its one of the easiest recipe. Tempting thali with a great write up...well done, Sia. I love you my sister! You made my day. I was just reading your 97th - 100th comments (lol) Hugs to you too darling. A packet of ready-to-eat rotis, gosh, when I saw your question and read my response, I got confused too! glad my blog could be of any use to u girl. all the very best for the main event. thanks viji. i too was/is busy with office work n not getting enough time for blog. Sia: M and my visiting aunt help and made Jolada Rotti this weekend! It was the bestest! thank you for the inspiration. We had that with a garlic chutney which my aunt conjured up. M separately made the stuffed brinjal following your recipe and it was stellar - i finished off the leftovers last night. Last week M also made the moong sprounts usli. Awesome! Sia..love the way you write..Such a beautiful spread. I too love the kind of food they have in Northern Karnataka.I am drooling at the delicious jolada rotti spread! This is not a north karnataka jolada rotti. To enjoy north karnataka jolada rotti, go to kamat hotel. people like u may be lucky enough to eat jolada rotti oota at kamat's everyday but unfortunately we stay away from home and country and we have no other choise than prepare it at home. i have tasted the rotti in kamat's when i was studying in b'lore and also tasted it at many Khanavali's (very authentic)in hubli and dharward when i was doing my graduation. so i do know how it tastes and thats what i have tried to create here for people like me who miss their home and want to eat something what they like but dont have the privlilage of tasting it places like Kamat's! lovely! What a grand treat. I think the pics and the receipe are really awesome. Something which is spicy and delicious. My mom always loved it. I am in love with it now. One of my friends made it was wonderful. It made me look into it and I searched for the receipe in inetrnet. I found yours and it looked delicious. I tried it out, it came wonderful. Also, after grinding the page, I sauted the paste with onion for 5 mins, thats' what my friend had done. Thanks a tonne for the receipe. I tried the rotti, it did not come out as good as the Yatri niwas/ New Shanti Sagar.